Celebrating 100 years since the discovery of King Tuts tomb, IMG has overhauled the production of King Tut: Treasures of the Golden Pharaoh. 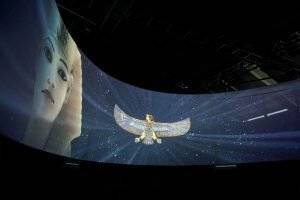 Design Electronics was selected as the audiovisual integration firm, with 13 years of experience supporting the King Tut tour, the most recent production has launched at the California Academy of Sciences. Scalable worked closely with Design Electronics and 7th Sense to support a 180 degree curved screen, calibrated automatically using Scalable Display Manager software. As the first stop in the exhibit, the 23’ wide and 7’ tall display engages attendees in an immersive AV experience that carries throughout the museum. The King Tut exhibit will travel around the world, concluding in Cairo in 2024. A traveling exhibit poses unique challenges to ensure that the displays can be set up with very high accuracy, and in a limited amount of time. Scalable’s automatic calibration software was a perfect fit to solve this challenge, allowing for the display to be quickly re-aligned anywhere in the globe. Next stop for the tour is Paris France, Scalable will be helping make King Tut shine at La Grande Halle de la Villette, on display March 23rd – September 15th, don’t miss the experience! Read more about this exhibit directly from AVIXA here. Scalable Display Technologies is the market leader in automatic, projection calibration software, specialized in dome projection, curved screens and simulation applications. Design Electronics focuses on providing custom-designed, state-of-the-art audiovisual, lighting, audio, security and surveillance solutions, to the corporate, government, retail, institutional, industrial and residential markets.